My obsession with cheese of all kinds continues. Today we will explore the delicious simplicity that is the grilled cheese sandwich. Everybody loves a mean grilled cheese with all of its melty-toastiness; it seems like it's a universal favorite, no matter what one's cheese preference may be. But after awhile the standard American cheese on white or cheddar & swiss on wheat can get a little boring. You want to try something else with your perfectly toasted or grilled cheese-filled concoction, make it grow up a bit. I have many variations of grown-up grilled cheeses that I plan to post, but this one is currently the star. This isn't a quick lunchtime sandwich; this is hearty, fragrant, flavorful and definitely holds its own as a nice dinner when paired with a fresh salad and a glass of wine. What makes this so different, you may ask? It's just cheese & bread, right? Sure, but it's Fontina cheese, with smoky nutty tones accented beautifully by the sweetness of caramelized onions and shallots. I like the combination of the two because of their individual flavors: the red onions are stronger, more pungent, and zestier, while the shallots lend a more delicate taste and aroma. This will all go well on top of any crusty type of bread, but I feel that the chewiness of Ciabatta that's been lightly toasted in a warm oven goes best with the eventual gooeyness of the melted cheese. Of course, the best part about any grilled cheese sandwich - aside from the taste - is the price. It truly is an affordable meal. People have been eating staples of bread and cheese for centuries, not only because they pair well but because they are relatively affordable staples. Does a wedge of Fontina cost a bit more than a pack of American cheese? Perhaps, but not by much. A pack of 16 slices (about 12 oz.) of Kraft American Cheese will regularly run about $4.50 at most grocery stores, while store brands run about a dollar less. A 1/2 lb wedge of Fontina will cost about $4-5, and once it's been shredded, it yields about 2 cups (16 oz.). You've just scored 4 oz. of extra cheese for roughly the same price, and can take comfort in the fact that you're eating real cheese, as opposed to a "pasteurized cheese food product". Nothing wrong with some American cheese now & then, but it is very much a processed food with less nutritional value than the real thing. Preheat oven to 425°. Line a cookie sheet with aluminum foil and set aside. Peel and slice the onion and shallot lengthwise, making sure to separate all the pieces so that they're not clumped together. Heat 2 T olive oil in a skillet over medium heat, then add the onions, shallots, and salt (if you like a sweeter result, add just a small pinch of sugar). Cook the onions slowly until they become translucent and browned. Remove from heat. Place the four halves of ciabatta on the foil-lined cookie sheet and add 1/4 c shredded Fontina to each slice. Cook in the oven for about 5 minutes, or until cheese is mostly melted. 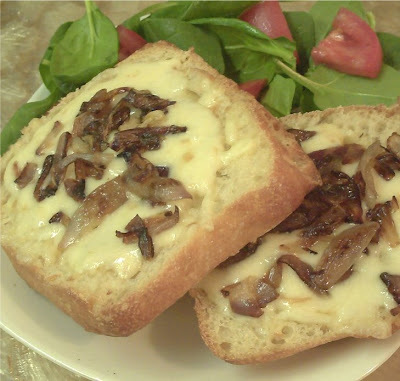 Carefully slide out the oven rack with your sandwiches and add about 1 T of the caramelized onions & shallots. Put the sandwiches back into the oven and cook for another 2 minutes or until the cheese barely starts to brown. You don't want crispy cheese, but some browned bits at the top of the melted Fontina are always tasty. Serve with a nice salad and perhaps some wine, and enjoy! This looks so simple and yet so satisfying. Did you know about the Grilled Cheese Invitational in SF recently? I can't help but think that a Fontina cheese concoction would have ranked highly there. I also like how you break down your recipes into overall cost. I really need to do that, too, but I'm terrible with accounting. Thanks for posting this!